Napoleon was sent to prison on a small island 20 km off the coast of Italy that had a total of 12,000 inhabitants. He tried to commit suicide at one point, but would focus his attention on escape after that failed. A few close friends would eventually break him out of prison on a ship. The new French King Louis XVIII sent the 5th regiment under Marshal Ney to arrest Napoleon after he found out. 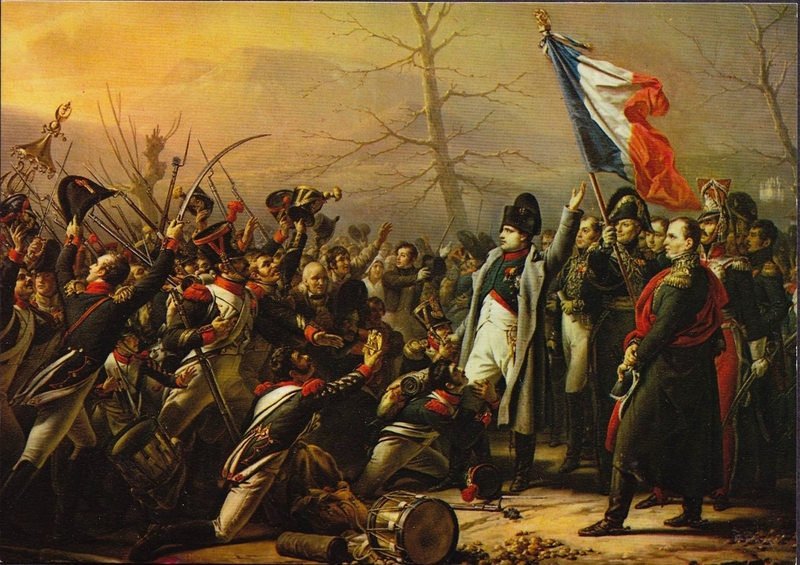 Once the 5th regiment found Napoleon, he would simply walk up to the troops and say “If one of you wishes to kill his Emperor, here I am.” At the sight of this, the troops would shout “Vive L’Empereur!” and join him instead of arresting him. The troops surrounding Napoleon marched on Paris and caused King Louis to flee the city, not being ready for his men to have turned on him this way. He would rule France again for 111 days after his return, a period known by historians as the Hundred Days. The Congress of Vienna, which had been debating some changes in Europe, would declare Napoleon an outlaw and send troops after him. Napoleon immediately put together an army of 200,000 men to mount a pre-emptive attack Prussia and condense his power. He hoped that a quick attack might cause the coalition to crumble because he knew he would lose if they had time to unite together. The first attack would be on the Prussians in Belgium, hoping to inspire a revolt by the people there. The French would fight a major battle against the allies under the Duke of Wellington in Belgium. Napoleon picked the perfect location for the Battle of Waterloo (1815), being able to conceal his numbers because he was sitting on a ridge. The allies under Wellington waited for battle on purpose, hoping the rains and wet grounds would help them in battle. As simple as this is, the wet ground had a huge impact on this battle because it slowed french movements and invalidated French tactics in battle. The French tried to separate the two allied armies in battle and drive the British into the ocean. The British cavalry tried a cavalry attack but the French counter attack would cause major losses for the British. When the French tried their own cavalry attack under General Ney, it would fail due to poor coordination. Napoleon tried to risk it all in a direct attack because he realized he was going to lose if he didn’t do something big. The attack by the Imperial Guard would be a failure but they wouldn’t give up, saying “the Guard dies, it does not surrender!” The French lines would lose in every direction after the Prussians brought in extra troops, and the French retreated even though Napoleon tried to stop them. This loss became Napoleon’s final battle and most decisive loss of his career. It would become the official end of both his military and political career. His army would disintegrate after losing over 90% of their men in the retreat from battle and Wellington would become a hero for such a lopsided victory. Many people claim that Napoleon’s poor health may have contributed to his loss here. He had trouble seeing the battlefield, and therefore making decisions because he was dealing with crippling hemorrhoids that made it impossible to sit on a horse. This caused him to allow his subordinates to make decisions, which caused a lot of mistakes being made during the war. Napoleon would return to Paris with what was left of his army and would abdicate in favor of his son again, but this wouldn’t be accepted for a second time. When he found out that the Prussians had orders to kill him, he would plan an escape to the US instead, but the British stopped this possibility. He had no choice but to surrender once he realized he was stuck. The Treaty of Paris would officially put an end to the Napoleonic wars and would put King Louis back in power. France was reduced back to its 1790 boundaries, would be limited to a 150,000 man army, and would be forced to pay 700 million francs in indemnities. This treaty would start an era of peace in Europe that lasted for almost half a century.